Nexter, a KNDS group company, European leader in land defense, is present at the Euronaval exhibition from 23 to 26 October 2018 in Paris Le Bourget. Nexter, an architect and land defense system integrator, providing 100% of the combat vehicles of the French Army, is also a weapons system and ammunition manufacturers of the Air Forces and Navies. All the group’s know-how and high technologies, especially concentrated in the future vehicle of the SCORPION program - EBRC-JAGUAR, VBMRGRIFFON and Lightweight VBMR-SERVAL - are available throughout the Nexter range deployed on combat aircraft Rafale, Tiger combat helicopter, or aboard the Charles De Gaulle aircraft carrier, the Multi-purpose frigate (FREMM) and the Mistral class amphibious assault ship, always at the service of the fighter. Nexter is showcasing its mid-caliber naval weapon systems such as NARWHAL® 20A and for the first time the RapidFire® T40 anti-aircraft turret. NARWHAL® performs very short-range self-defense missions against drones and light craft. Equipped with the 20M621 gun, it is particularly suitable for surveillance and maritime police operations. This weapon system is adopted by the French Navy and many foreign navies. The RapidFire® anti-aircraft system 40, designed in partnership between Nexter and Thales, performs short-range self-defense missions. Thanks to the accuracy and efficiency of the CTAI (Joint Venture Nexter and BAE) 40 mm gun and ammunition, the RapidFire® T40AA system is capable of intercepting helicopters, drones or light craft up to a distance of 4000 m. This performance is achieved through a viewfinder with electro-optical day/night cameras and a moving target tracking function. 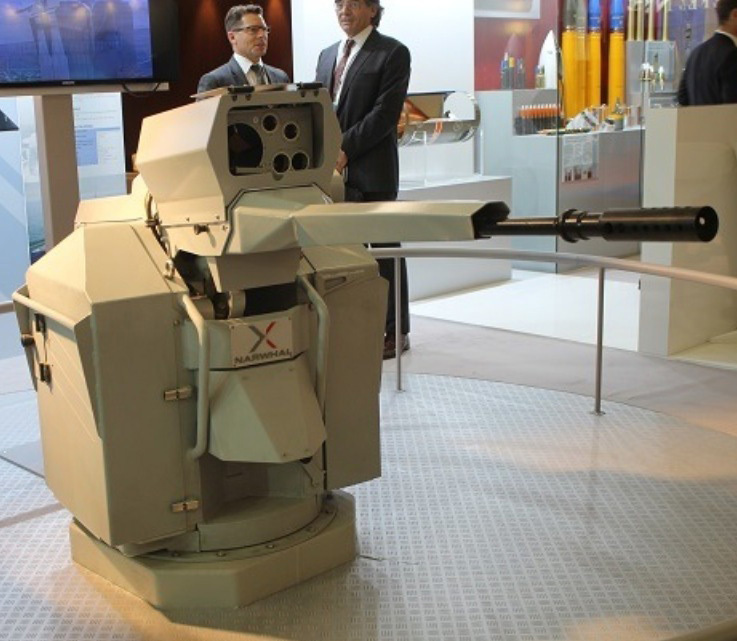 In addition, Nexter group is presenting its entire range adapted to naval equipment. Ranging from 20 to 30 mm caliber to 127 mm ammunition as well as the 40 mm telescoped, these shells are optimized for anti-ship and air defense, including anti-ship missiles. Nexter is dedicated to meet the needs of the French land forces and of Nations on an international scale. The scope of its business includes as well the supply of weapon systems and ammunition for air and naval forces. Nexter also provides systems and protection solutions in the field of homeland security. The group continues to apply its international development policy with 58% of the order intake in 2017 intended for the export market. In France, Nexter is fully committed to meeting the objectives of the SCORPION program, through the upgrade of the Leclerc tank and the development of the future VBMR Griffon and EBRC Jaguar vehicles within the temporary business venture between Nexter, Thales and Arquus, as well as the Lightweight VBMR.